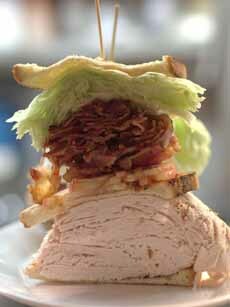  This turkey club needs cranberry mayonnaise (photo courtesy Carnegie Deli [now closed]). 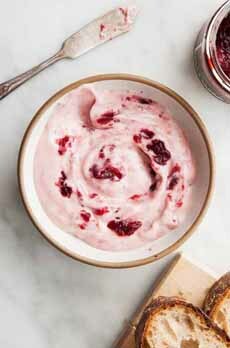 Cranberry mayonnaise (photo courtesy Good Eggs). Turkey-cranberry lettuce wraps with julienned Granny Smith apple (photo courtesy QVC). Before you make that first turkey sandwich, whip up some cranberry mayonnaise. Mix as much cranberry sauce as you like into mayonnaise. We use 50:50 because we adore cranberry sauce, but a 3:1 ratio is more popular. Use it on burgers, too: turkey burgers, veggie burgers, beef burgers. Plus ham and other sandwiches. You can also turn cranberry sauce into a dip for crudités. You can use straight mayonnaise, or divide it 50:50 with plain yogurt or sour cream. Pulse the cranberry sauce until smooth, then blend it into the mayo mixture. 1. MIX the lemon juice, rosemary and cranberry sauce into the mayonnaise. Finish with a pinch of black pepper to taste. That’s it! This recipe is from QVC’s chef David Venable; it adds walnuts to the cranberry mayonnaise. You can make the cranberry mayonnaise in advance. David advises: Choose large-leafed, pliable lettuce to make these wraps. Romaine, red leaf and escarole are all good options. We’ve adapted this from David’s original recipe, which used 16 slices of deli turkey. 1. MAKE the mayonnaise: Whisk all of the ingredients together in a medium bowl. Cover and refrigerate until needed. 2. ASSEMBLE the wraps: Lay the lettuce leaves out flat on a large work surface. Carefully remove 3/4 of the hard center core with a knife. Layer 1/8 of turkey on top of each lettuce leaf and distribute all of the cranberry mayo on top of the turkey, spreading evenly. 3. 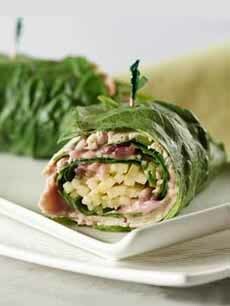 LAYER 1/4 cup of baby spinach on each wrap, followed by 2-3 tablespoons or 1/8 of the julienned apple. Roll up each lettuce wrap and secure it closed with a toothpick.